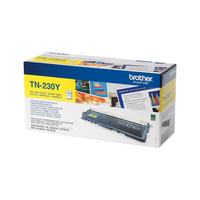 Bring out the best in your printing with the Brother TN230 Yellow Toner Cartridge. Premium printing Brother formulated toner ensures each print is high quality with sharp resolution and excellent reliability.The TN230 Yellow Toner Cartridge is compatible with the following Brother printers,HL3070CW,MFC9320CW,MFC9120CN,DCP-9010CN MFC-9120CN MFC-9320CW HL-3040CN HL-3070CW. With an estimated 1400 page yield you'll always have enough ink for all your documents and creations. Give your print outs a vibrant hue with the Brother TN230 Yellow Toner Cartridge!